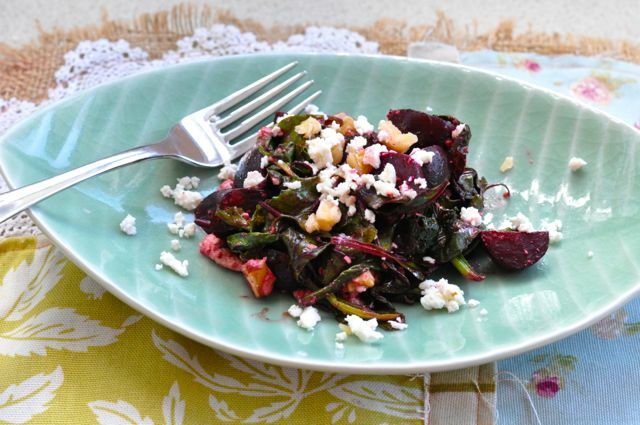 From my garden to my table – Warm beetroot salad. One of the redeeming features of living in suburbia is a big garden. 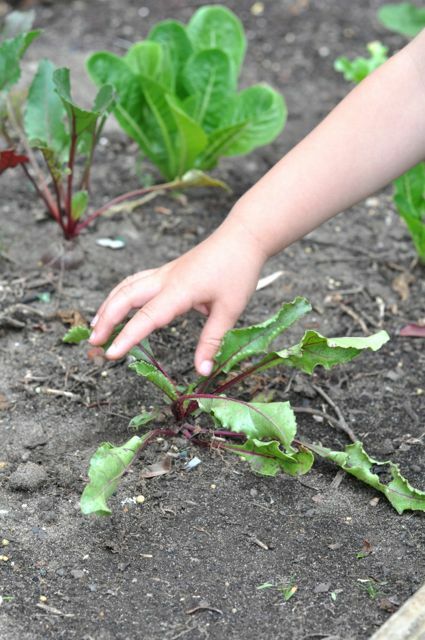 I always dreamed of having a vegetable patch, not because I’m adept at farm husbandry nor even possess a particularly green thumb, but because I wanted to teach my kids about where food comes from. Thus far our lettuces have been prodigious and our spring onions have certainly sprung. Our truss tomatoes are also worthy of a special mention as there is nary a day that we can’t harvest a luscious, sweet fruit from the vine. I’ve had my eye on the beets for what feels like months……the leaves were fab and green, then died, then grew again, and the beets themselves, well…… they’re organic. I was expecting greater things from my first round of beetroot. My Dad said to pull them when they were the size of snooker balls, but they sort of stopped at an assortment of testicles and eyeballs. I kept hoping for another growth spurt, alas, I think they’d done all they were gonna. I shuffled a few around in vain hope that they would do something spectular but thus far they’re looking sad, with the leaves lying down and resting (not dead, resting). This is one of my favorite salads of all time. It’s super easy, quick and tasty and spectularly good for you. I would like to add at this juncture that it also make a fascinating talking point for potty training toddlers, because it is most startling to a novice. I admit that I usually make a much larger amount than this but my yield was a tad paltry. Mess with the amounts to your taste. I like lots of nuts and tangy balsamic. one bunch of baby beets or a few large beetroots, leaves intact, washed. 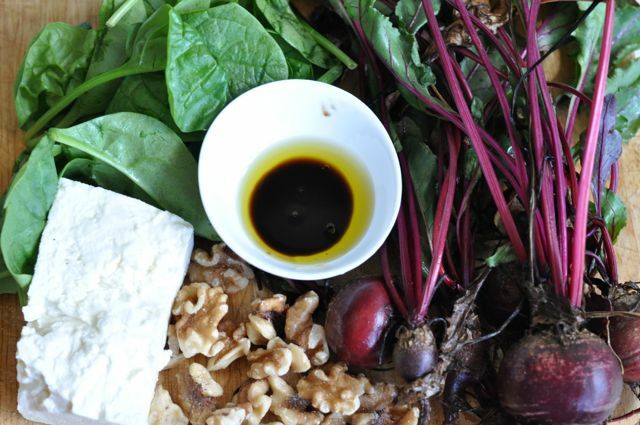 Wash beets and remove, but save, the leafy tops. Wrap beets in foil and place in hot oven for about 30 minutes (depending on size. These took only 15 minutes. Give them a poke and if they yield , they’re ready). When cooked take out of oven and leave to cool. Take off foil and slide the skins off with a firm thumb.Discard skin and foil. Chop beets into desired size. If your beetroot is store bought, your leaves will need to be chopped a bit. Mine were still little and tender. Add olive oil to a large fry pan and toss in your leaves, stirring until just wilted. Chuck in some balsamic or a squeeze of lemon juice. Add beets to pan. Break your walnuts up a little and toss them in, season and take off heat. Crumble your fetta through, and voila! 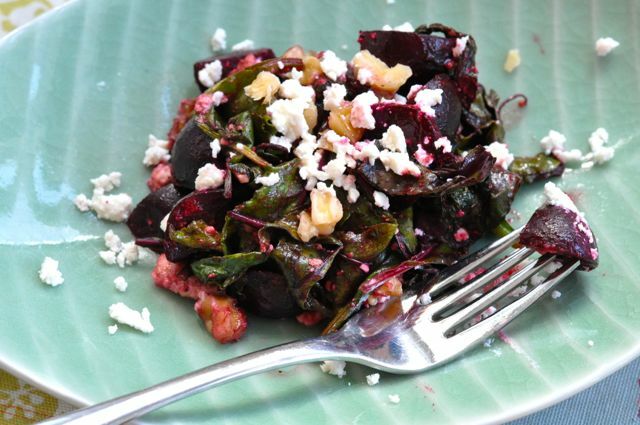 Warm beetroot salad loves steak, pork, chicken or fish so it’s super versatile. Roast some potatoes, steam some beans and you are well on your way to food nirvana! Losing Our Wilsons….A Farewell Yum Cha. I absolutely adore roasted beetroot, but haven’t had the guts to try and roast them myself. Will definitely have to try this recipe – yum! Ha! You had me at testicles and eyeballs. When we were kids my sister and I used to pull up a carrot every day to check if they were ready yet. Your salad looks lovely. The contrast between the white cheese and the gorgeous beets is awesome. We’ve just constructed our raised garden bed this weekend and had a huge pile of soil and compost delivered from Flower Power. I am very excited about getting started. 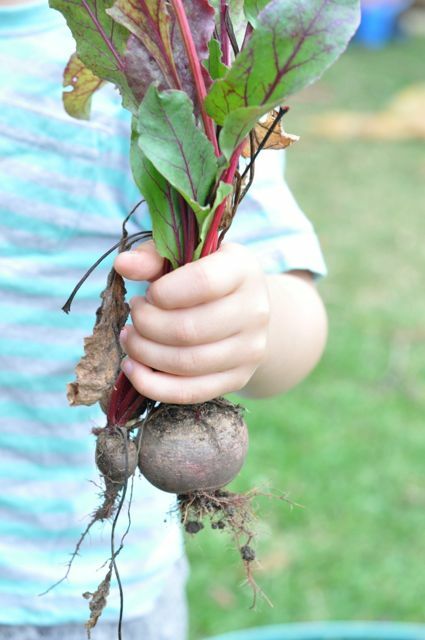 I have to say that I’m petrified of serving my kids beetroot….too many beige rugs in our house! Ha! Yep, be afraid. Be very afraid!! ……my littlest heart meets the sea.